It's Just Mobolaji | Music & Entertainment: Event: The Drop @ Proud Camden, 4th March! Another month, another ‘The Drop’ event taking place. 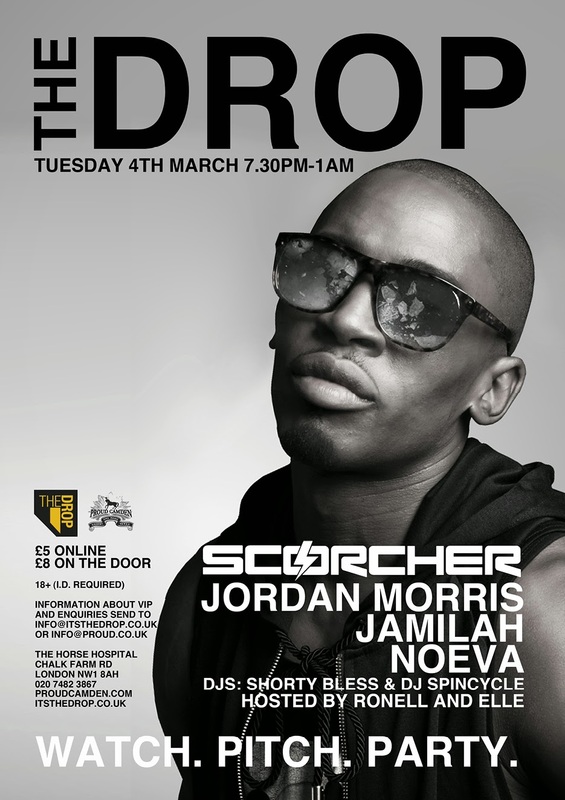 This time it consists of Scorcher, Jordan Morris, Jamilah and Noeva who will all grace the stage London's Proud Camden. The Showcase is a chance for you to kick back, relax and enjoy live performances from some of the best unsigned artists accompanied by a live band. Every month we select 4 amazing artists to perform at our showcase. The Search is the most important part of all; producers and songwriters will have the chance to submit demos for the projects of those 4 artists each month. All you have to do is visit www.itsthedrop.co.uk/Tipsheet to find the artists' project briefs, create the records that you think would be suitable for their project, and email your submissions to submissions@itsthedrop.co.uk. The Party will kick off as soon as the showcase finishes, with some of the UK’s finest DJs on the decks. This is a chance for you to get down on the floor, socialise and network with like minded people. Advanced tickets are priced at £5 (online), with general admission (on the door) tickets priced at £8 and can be purchased via fatsoma here: http://www.fatsoma.com/events/104348/ this is an 18+ event and ID will be required for entry.